The 2016 Newport International Boat Show (NIBS) returns Thursday, September 15th! After a seaside summer full of events on the water, Newport's docks will flood with boaters yet again to showcase sailboats, powerboats, apparel, electronics, and accessories. We caught up with NIBS Show Director Nancy Piffard, who shared some of her favorite updates to this year's show. And in case you missed the first one, stay tuned for more #NIBS2016 giveaways and contests – we'll have more info in our next post. Whether you're new to attending NIBS or making your annual pilgrimage to New England's sailing epicenter, you're in for a treat. Every year this cornerstone event brings together hundreds of the best boats and boating products in the industry. Read on for some of the questions we posed to Nancy, and chime in on Facebook with follow-ups questions. Did you encounter any new challenges or strokes of luck with this year's planning? The Newport Yachting Center site underwent tremendous renovations this past winter – a new Sperry Tent was erected near the marina, a garden and seating area was established, new pavers installed, new restrooms and shower facilities built, etc. Some of these renovations changed the size of our boat show display space. It was a challenge to move exhibitors who have been in the same spot for 30 years to a new location. We even considered a double-decker tent – but that’s next year’s project. Have you made any changes this year due to feedback from attendees or exhibitors? We have added more educational seminars and workshops this year: CruiserPort University presented by PassageMaker, Sail, Soundings and Power & Motoryacht Magazines, will take place all day 9/14 through 9/17 at the Newport Blues Café, right across the street from the show site. A variety of topics and demonstrations will be presented by experts in their field. These courses benefit cruisers of all levels. On the weekend, there are half-day workshops at Seamen’s Church Library hosted by Pam Wall and Lee Chesneau. Back by popular demand is our At The Helm program by Confident Captain for new boaters or those needing a refresher course. Classes are on the water in either a powerboat or sailboat with a certified captain. This year, At The Helm has partnered with Boston Whaler as the official powerboat and Beneteau America is the official sailboat of the program. 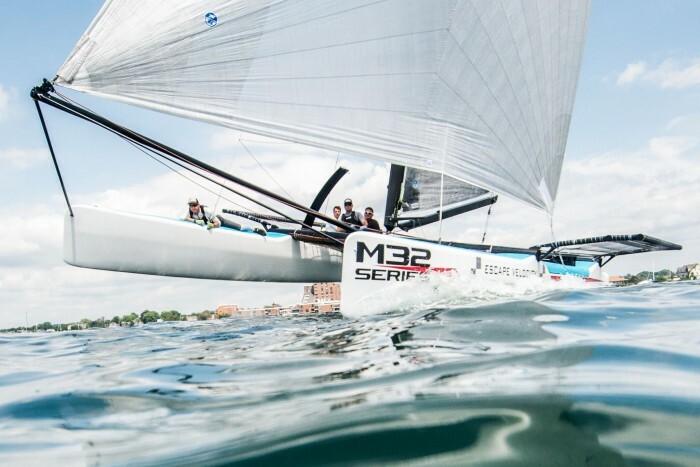 Confident Captain will also offer a professional sailing experience on a high-performance M32 catamaran. Participants can sail on this boat recently used for the World Match Racing Tour and which is considered to be one of the most exciting boats on the water. Which new exhibitors are sure to make a splash this year? There are lots of exciting powerboats and sailboats making their first ever debut in the United States at the Newport Show. Bertram Yachts is back, World Cat catamarans, the M-32 high performance boat will be on display, Maine Cat has a new sailboat. Coastal Craft Yachts, Delta Powerboats, Dream Yacht Charters, are all new this year. What typically presents the biggest challenge in organizing the boat show? Boats changing size right up until the last minute or being late for stage-in time causes a back up. Also, as you might imagine, rough seas, or high winds during stage-in can cause delays. Other things such as the internet going down or Wi-Fi not working can all be stressful, but we always find a way to manage! What is your favorite part of the show once it's underway? Getting through opening day, which is usually spent putting out fires due to unusual, unexpected issues. By Saturday we are up and running and I get to go around and see everyone that I haven’t seen in a year. I really like good attendance and a “buying crowd” so that the exhibitors are happy. Sunshine makes people happy! What advice do you/your team have for NIBS-attendees? Plan ahead on what you want to see! Get acquainted with the show site. If you're taking a seminar or two, register ahead of time. Go to the website and check to see if the boat brands or products you are interested in are at the show. Wear comfortable shoes. (We recommend Sebago shoes, the “official shoe of the Newport International Boat show.") Don’t bring young children on the docks in a stroller, it’s too dangerous. Have fun and dream big. 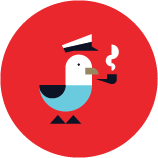 We love that you've brought Sailors for the Sea on as an environmental partner! What initiatives does NIBS employ to encourage green boating throughout the event? We've stationed recycle bins throughout the boat show and encourage our attendees to use them! To decrease congestion and pollution show-goers can leave the cars at home: water taxi service is available from show to show, as well as shuttle service from Easton’s Beach parking lot, and a convenient ferry between Jamestown and Newport. We also use paperless ticketing, which means gate staff can scan the ticket bar codes stored on smartphones rather than force attendees to print their tickets, saving paper. Where should boaters head in the evenings for the full NIBS experience? On-site evening events are invite-only industry networking sessions, but afterwards our exhibitors head to their favorite watering holes – typically the Mooring, The Smokehouse, 22 Bowen’s, Clarke Cooke House, Midtown Oyster Bar, or the Black Pearl. Do you and your team celebrate once all's said and done? We are so tired right after the show and basically “crash” from the build-up of opening day to the end of another show. But by the end of the week – we go out to lunch and celebrate! Thank you to Nancy and her team for putting together what promises to be another great boat show! Will you be attending? Let us know via Facebook or Twitter, or in the comments below.